Home Features Feature: Best Watches under $100! Feature: Best Watches under $100! Welcome back to another post on watches! Several of you guys have reached back out to me after reading my Watches under $300 article (I think I’ll do another article on $300 watches actually) and feed-backed that while you guys loved the content, $300 is still too much for a watch. As such, I’m gonna do a Watches under $100 article here – at this price point, it’s incredibly easy to go wrong so I’m gonna tell you guys what to look out for, recommend my personal favorites, as well as brands to avoid. At this price point, you shouldn’t be expecting much – you’re looking for something that would last you 3-5 years hopefully, and not break in 3-5 months. The main thing that you should be looking out for is an iconic design, along with a reputable brand. In this price category, there are a lot of sub-par products from crap brands (some of whom I’ll call out below) – getting a watch with character from an established brand secures you the most value in this price range IMO. A lot of brands at this price point try to brand themselves as European, but in fact use cheap Chinese components in their watches, and basically copy the design of established brands. Such brands/companies will tend to have an enormous catalog of products, ripped-off designs, poor to non-existent customer service/warranty, and high list prices, but perpetual online sales. A lot of their watches look good in online photos, but once the watch arrive and you hold it in your hand, you can instantly tell that it’s cheaply/poorly made. Two of the most common brands that I see people fall prey to in this price category are Stuhrling Original (Their watches flood Amazon and Ebay), and Megir (their watches saturate Lazada, Qoo10, etc). Stuhrling Original is a brand that I absolutely despise. (This is my own personal opinion, so please Stuhrling if you’re reading this please don’t sue me) Firstly, they have an insane catalog of hundreds of watches. This makes strict quality control near impossible – I have heard of others whose Stuhrling watches break on them in a mere couple of months. And when they do, warranty and servicing is a chore, due to their almost non-existent customer service. You can’t expect a company selling “Swiss” watches for $100 to have enough resources to thoughtfully design and quality check hundreds of models, as well as have good customer service! Talking about design, they blatantly rip-off designs from established watch brands. Stuhrling says that they are offering “Luxury design for the masses”, but that’s just an euphemism for design plagiarism. Megir watches are currently flooding Lazada and Qoo10, due to their insanely cheap prices. For example, the model pictured above can be found online for around $40. Please, for the love of God, don’t buy these cheap Chinese watches. The above design is an obvious rip-off of the Panerai Luminor, and uses poor-quality Chinese parts. The glass is not even mineral – its acrylic, which is incredibly susceptible to scratches. The “leather” band is trash. If you can’t afford the real thing, save up until you can afford it, or at least get something respectable (like the watches I’m gonna recommend below). Don’t be a loser and get a knock off. The Timex Weekender Chronograph in blue. The Timex Weekender has always been one of the best-value watches on the market. Beautifully designed, durable, versatile and insanely affordable, the chronograph version of the Weekender is a winner. Firstly, you’re getting a reputable brand in Timex. Timex has been making watches in America since 1854, and has a long and rich history in watchmaking. Secondly, Timex watches are known for their durability. In fact, their slogan is “It takes a licking but keeps on ticking!” Thirdly, in my opinion at least, the classic design of the Weekender is iconic – nobody would mistake it for anything else. In addition, it’s incredibly versatile – the NATO strap works well for a casual occasions, while pairing it with a leather strap is an easy way to dress it up. Above all, you’re getting a watch with tons of character. You can find them for sale on eBay at around $90 SGD, which makes them an absolute bargain. If you’re looking for something dressier and bolder than the Timex, the Casio Edifice 526 Chronograph is my pick. Striking design, good build quality, luminous hands, chronograph and date functions, all these make for a great value buy. This is one you can wear with a suit and get compliments from those around you. With the striking blue/gold dial and well thought out chronograph sub-dials, I believe this is the best dress watch you can get for $100. At the time of writing, the watch can be found on Lazada for $100 on the dot. It would have been watch blasphemy if I didn’t include a G-shock in the list. 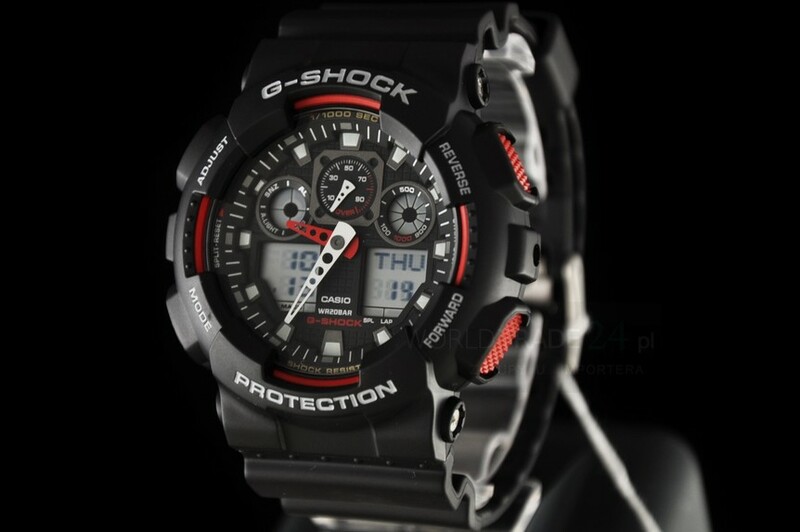 I’ve always found G-Shock watches to not only be extremely functional, but also packed with tons of rugged character. In particular, I love the look of the G-shock GA-100, especially the black and red colorway – the red and black accents, along with the various sub-dials, evoke to me the dashboard of racing cars. Wear the G-shock while doing sports, or casual wear – you will gain instant street cred. Furthermore, a lot of innovation went into making G-shock watches near-indestructible. For a mere $99 on Lazada, you can get the result of that innovation. What’s not to like? Previous articleFeature: 5 types of shoes every guy should own! Next articleFeature: Best Watches under 15K!